The folks at Turn 10 have recently announced the details on the January 2013 Recaro Car Pack and as is the case with many of the downloadable content (DLC) for the new open world racing game – the January Car Pack features a unique spread of vehicles that ranges from the 1983 GMC Vandura to the Lexus LFA Nürburgring Edition plus a special gift for those Horizon racers who purchased the Season Pass. Forza Horizon is a real world racing simulation game and the January Recaro Car Pack offers a spread of vehicles that touch on a variety of classes from the real world that extend well beyond the standard sports cars that you would expect to see in a racing video game – although the January Car Pack contains some vehicles that will be right at home in the high speed world of Forza Horizon. The basic car pack contains 6 vehicles including a cargo van, a large sport utility vehicle and four 2-door sports cars with three vehicles from American automakers, 1 from a Japanese automaker, 1 from a German automaker and 1 from Lotus while those who receive the Recaro Car Pack as part of their Forza Horizon Season Pass will also receive an additional 2-door sports car as a bonus for buying into the special pre-order program in the form of a rare Italian supercar. 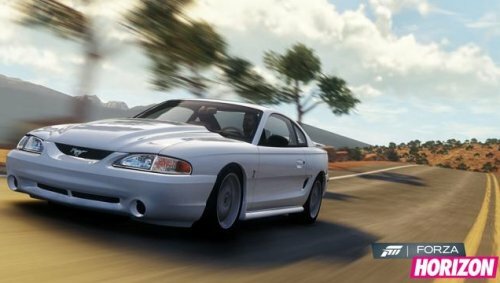 First off, the January Recaro Car Pack for Forza Horizon features four sports cars that come as no big surprise including the 1995 Ford Mustang Cobra R (shown above on the right), the 2005 Mercedes Benz SLR, the 2012 Lotus Exige S and the 2012 Lexus LFA Nürburgring Edition. Joining those four usual suspects are a pair of heavy haulers that seem a bit unusual for a racing simulation game and this pair begins with the 1983 GMC Vandura and ends with the 2012 Cadillac Escalade ESV. The Vandura and Escalade are a bit out of place on a closed circuit race course but considering the open world design of Forza Horizon – these two large vehicles will find themselves at home alongside other bigger vehicles like the Jeep Grand Cherokee SRT8 and the Ford SVT Raptor F150. If nothing else, these heftier full sized vehicles will be great for Playground games like Cat and Mouse when the need to have a big, physical vehicle comes into play. In addition to these 6 (or 7) new vehicles to hit the virtual new car lot of Forza Horizon, there may be some new monthly Rivals events to feature these vehicles – thus providing more incentive for gamers to buy this package in the event that the lineup on its own doesn’t inspire some folks to spend $5 on these six new vehicles. The January Recaro Car Pack goes on sale via the Xbox Live Marketplace on Tuesday, January 1st 2013 with a price of 400 Microsoft points ($5 USD) but if you chose to buy the Forza Horizon Season Pass when the game was released, you get this DLC for free. On top of that, as thanks for buying the Season Pass, Turn 10 will be dropping a 2009 Pagani Zonda Cinque Roadster into your inbox as a special gift. Season Pass buyers receive a free “bonus car” with every car pack included in the special pre-order package.